Mangalore, Oct 14, 2014: Bunty, the five year old tigress at the Pilikula Biological Park who had sustained serious injuries after she was attacked by seven year old tiger Kumar in the enclosure on October 13, Monday, has succumbed to her injuries on October 14, Tuesday morning. According to Jayaprakash Bhandary, the Director of the Park, Bunty failed to respond to treatment as she had suffered deep injuries on her neck due to the attack on Monday evening. 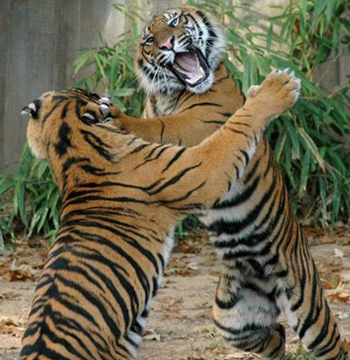 The two tigers were left in the enclosure on Monday morning for mating purpose. However, Kumar who was quite normal throughout the day, pounced on Bunty during the evening taking her unawares. Bunty has been cremated after a post-mortem.